I’m sure if we were to sit down with you and discuss your current telescopic bleacher situation, the first thing you would say is, “Well, that sounds nice, but we don’t have the funds for that.” Capital improvement projects are an investment, and investments take time so if you don’t already have funds set aside, have a donor prospect or dedicated fundraising team with time to prepare, your options may seem limited. Seem is the key word. You can streamline the process so it’s more efficient. Rather than soliciting with your own Request for Proposals (RFP), Sourcewell, previously NJPA, is a national cooperative purchasing agent that has already done the work for you. Going with a purchasing agent like Sourcewell means they’ve already vetted out the bidding process to bring you the best value to fit your needs. “Cooperative purchasing is “Procurement conducted by, or on behalf of, one or more Public Procurement Units” as defined by the American Bar Association Model Procurement Code for State and Local Governments. Did you see that? Even Safety Inspections, Parts & Services is on this list – giving you the advantage of combined buying power and the ability to cost effectively do your due diligence we mentioned in our previous post. The grants we hear about most often stem from the Ohio Bureau of Workers’ Compensation Safety Grants. If your bleachers are unsafe, for either you (staff and set up team) or your patrons, you’ll want to look here and see what is possible. The application process can rigorous, but it can be helpful when it comes to replacement, upgrades, and repair. “Wait, what does a device to move bleachers have to do with safety and security? Turns out the rules for the grant program were written to include a broad definition of “safety” for students and employees. So what does a device to move bleachers have to do with safety? Bleachers with an Integral Power System have the advantage over manually operated bleachers by not only reducing damages to your equipment but they provide a more safe way for your staff to open and close the bleachers. There are no ergonomically correct bleacher operating moves for manual bleachers. You’re usually walking backwards pulling when opening and pushing all bent over with your head down when closing with no way to keep your back straight during either. Regardless of the type of bleachers, you have to bend and pull and bend and push. When you are pulling the bleachers open or pushing them closed, you end up reaching the open or closed position by getting a big slam to a halt, causing impact to your back, legs, arms, shoulders and neck as well as the possibility of crushed fingers or smashing your face into them from slipping and falling just to name a few. 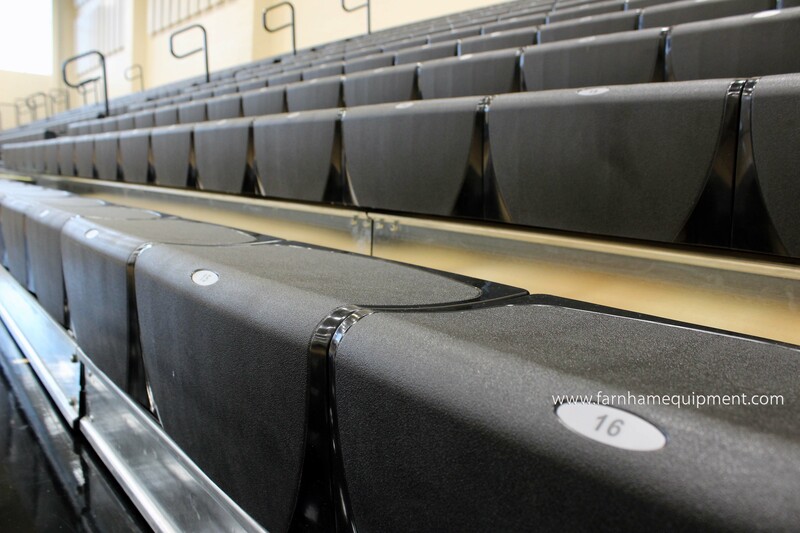 There have been some unique devices that have been fabricated and provided here and there but nothing reduces injury hazards like adding integral power to your bleachers. Just a reminder, only properly trained personnel should operate the bleachers to further keep safety at the forefront.